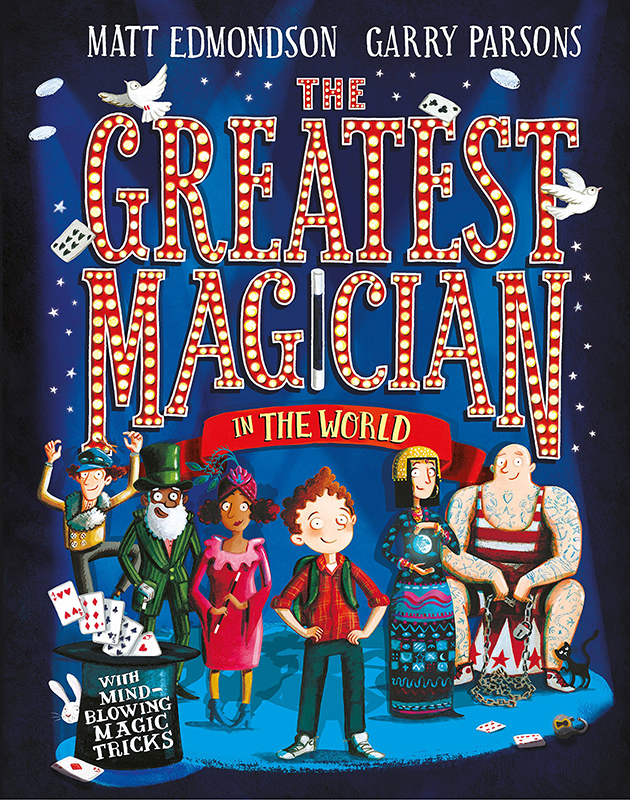 We are thrilled to share a behind the scenes look at the making of The Greatest Magician in the World illustrated by Garry Parsons, written by Matt Edmondson and published by Macmillan Children's Books. We follow Elliot on his quest to find the greatest magician in the world and join him as he encounters an enchanting cast of magicians. 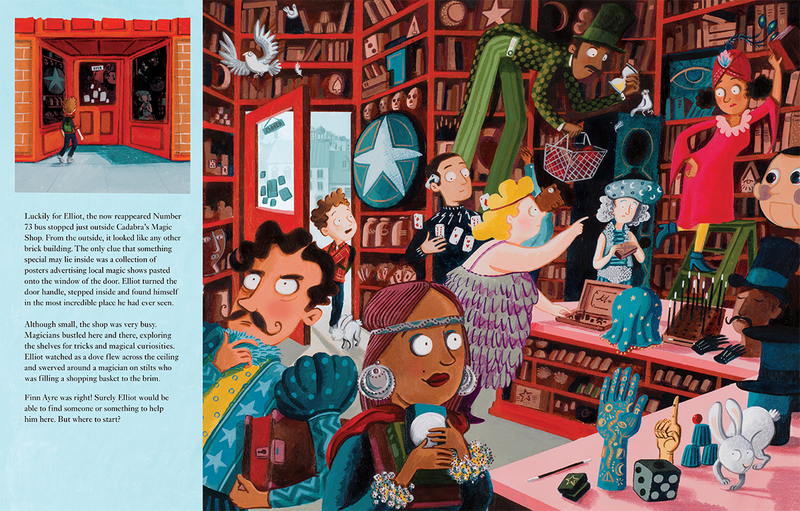 Garry's illustrations perfectly compliment Matt's witty story telling, the book is filled with curiosities and quirks from the magical world as well as seven amazing magic tricks for the reader to learn. We spoke to Garry about his working process, his research into the world of magic and his exciting visit to the mysterious magic circle. 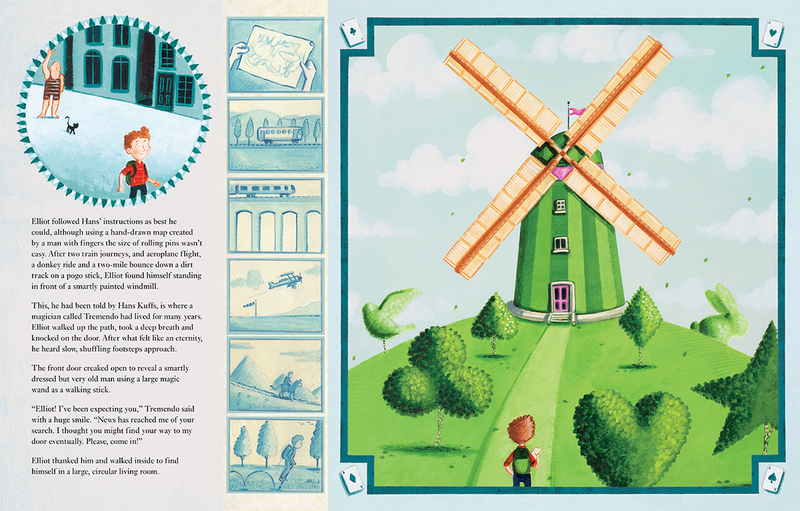 Because the book is aimed at slightly older readers it gave us scope to be a little more adventurous with the elements we could include, which was great. 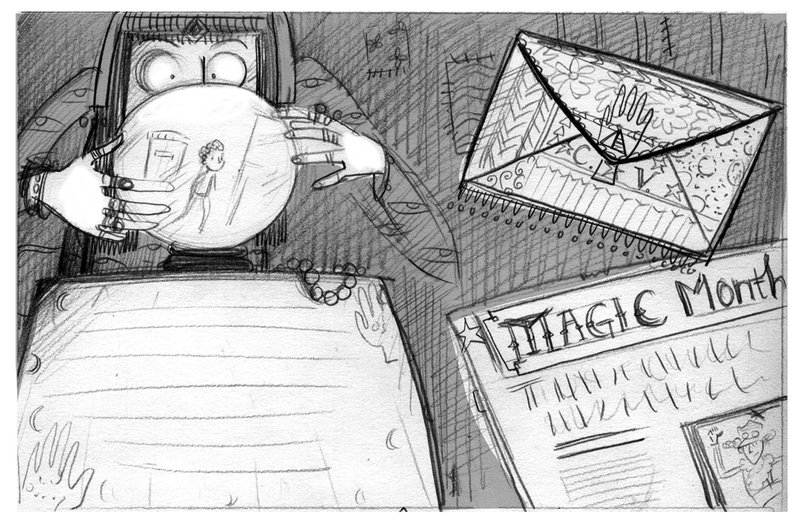 Each magician Elliot meets on his journey gives him a magic trick to master, which the reader can learn too. Each trick is housed in a neatly designed envelope or pocket, it was really exciting to have all these extra elements to illustrate. I worked closely with the designer to come up with ways to keep each magician's character running through the items needed for the tricks. So for example, Finn Ayre makes things disappear; his trick is contained in an envelope that pays homage to Magritte's "Empire of Light" painting, with the clouds taking on the forms of the things he'd mistakenly made disappear that day. 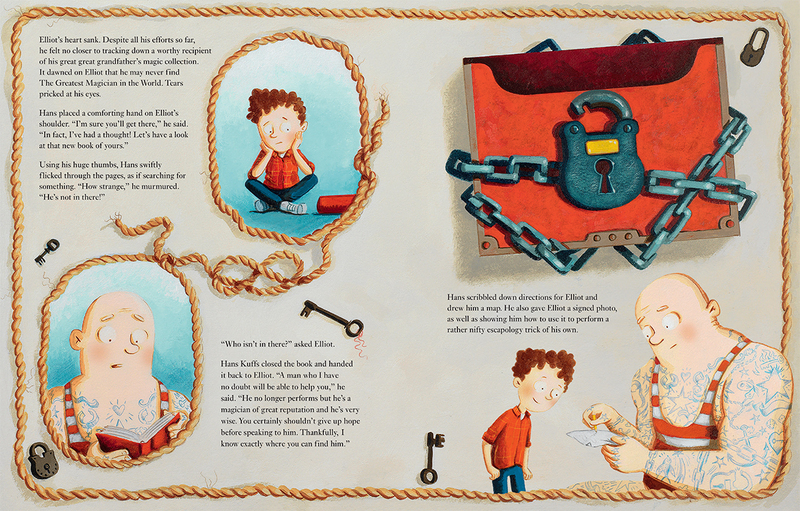 Another character Hans Kuff is an escapologist, so we disguised his trick as a chained and padlocked casket. 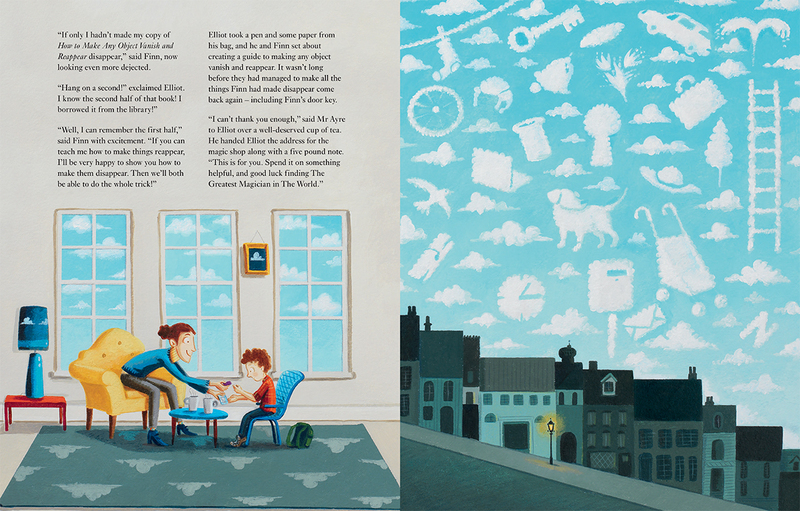 As well as the tricks, the book has a sliding pull-up panel on spread one, decorated vignettes throughout and comic book style sequences, borders and digital graphics. My picture book work is almost exclusively hand painted using acrylics but some of the pull out elements, like the backs of the playing cards, I made digitally. 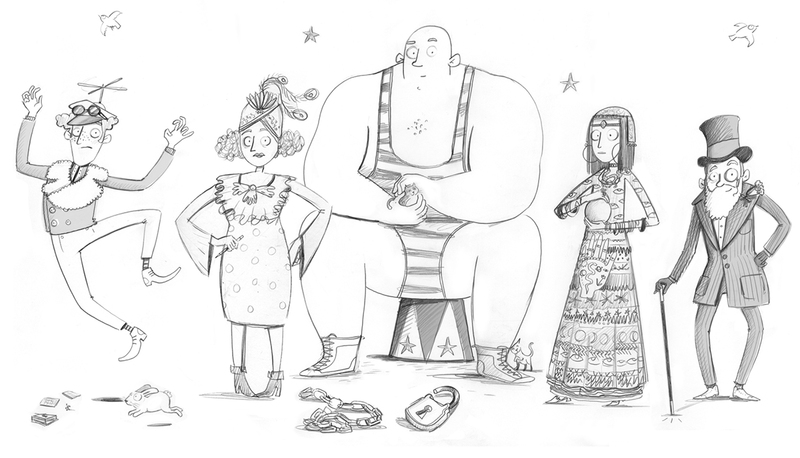 It was great to combine all these styles and make them work together. Matt and the whole team at Macmillan were great to work with, the project was very fast paced, so we all had to work closely together and really pull things out of the hat, excuse the pun! Matt's enthusiasm for magic is infectious, the first time we met he wowed us all with a magic trick and continued to do so at each meeting after that. This culminated in a trip to the Magic Circle to record the 'How to...' footage, which accompanies the book. Visiting the Magic Circle was a real treat for me, even the sign on the front door gave me a shudder of excitement. Matt and I will be at the Bath Festivals this weekend performing tricks together and introducing people to our cast of magicians, which I'm really looking forward to. I love doing events and live workshops, when you work on your own from your studio it is fantastic to connect with the audience. To see Garry's full portfolio, click here. Garry Parsons is represented by Kids Corner. Published on 6 October 2017.